El Mercado Janabiya ... construction nears completion. The iconic El Mercado Janabiya retail centre in Bahrain is in the final stages of completion and on target for its handover shortly. Finishing works on the structure are now proceeding along with the landscaping. 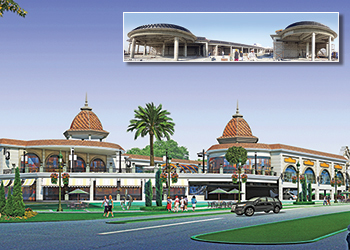 The project is owned by FB Janabiya, a subsidiary of First Bahrain Real Estate Development Company. It is being built by Almoayyed Contracting Group under a BD1.7-million ($4.5 million) contract awarded in June last year. The design and supervision consultant is Sanad Engineering. Site mobilisation started the same month followed by substructure works. 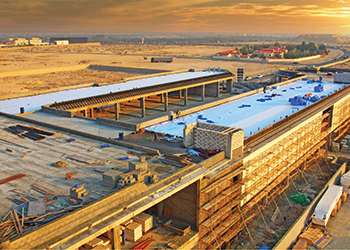 El Mercado Janabiya is an open-air retail centre built on an elevated platform on the outskirts of the Janabiya neighbourhood. Spread over an 86,000-sq-ft plot, it will offer 48,500 sq ft of leasable area. In addition to the supermarket and three anchor restaurants, the centre will offer 23 retail units sized between 151 and 1,990 sq ft each. The development is located at the corner of Avenues 27 and 79, just off the Shaikh Isa bin Salman Highway along the way to the Saudi-Bahrain Causeway. It sits adjacent to a cultural heritage site and is easily visible from the highway. Abu-Lughod ... prime retail outlet. He says embracing Janabiya’s identity and the areas around was one of the main concerns while designing this development, and it has impacted the architectural style considerably; hence it has become one of the critical success factors of the project. The core design elements are the landscaped courtyard, outdoor seating, and soothing water features, providing the perfect backdrop for families and friends to relax, shop, and dine. Overlooking the garden will be a variety of restaurants, shops, and cafes offering a wide array of products and services. The centre will be anchored by the Al Osra Supermarket which will provide the full range of daily necessities. Additionally, the ground floor will feature a street-side cafe and a drive-through McDonald’s restaurant while also accommodating 160 covered parking spaces for quick entry and exit. Commenting on the type of construction involved, Abu-Lughod says El Mercado sits on simple isolated footings, and comprises monolithic columns and beams built using high-strength concrete and precast slabs due to the limestone nature of site. All partitions are made with autoclaved aerated concrete blocks, to ensure light weight as well as superior thermal insulation. Furthermore, huge cranes were utilised for the installation of the floor and roof slabs due the project’s massive area and the limited site access. Abu-Lughod says all finishing materials were chosen very carefully by First Bahrain and its consultants to complement the concept of the project. 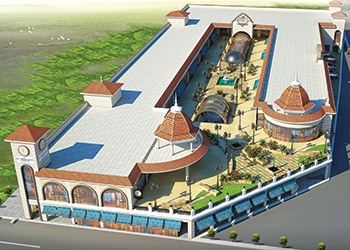 An artist’s impression of El Mercado Janabiya. “The combination of the light shade of ceramic tiles and dark shade of the Turkish travertine in the courtyard was well-studied to achieve the required ambiance within the mall,” he says, adding the finishing of the individual shops was left to the tenants’ choice, to give them the freedom of creating their own desired impact of their shops. World-class quality lighting systems have been provided for the project with all light fittings coming from Italy. This includes lighting control systems, adds Abu-Lughod. LED (light-emitting diode)-type exit signs have been provided throughout the project. These signs have three hours of back-up protection in case of power failure. In addition, all shops are facilitated with electrical power, ELV (extra-low voltage) system, boosted water supply system, drainage and firefighting, fire alarm as per tenant requirements. Power to the development is supplied by a 3,000-kVA substation constructed by First Bahrain, with EDD having provided the transformers. The project has been fitted with a fire protection system from Zeta Alarm Systems (UK). Meanwhile, a Zeta (UK) gas leakage detection system has been installed for gas detection. The detectors will sense and close all valves immediately in case of any gas leakage. A number of leading contractors and subcontractors and suppliers in Bahrain are involved on the project. The mechanical, electrical and plumbing (MEP) contract is being carried out by Two Seas Electromechanical Services with MEEB as the MEP consultant. Al Zayani Commercial Services has fitted escalators, elevators and lifts from the renowned Kone brand while lighting fittings have been supplied by Universal Lighting and Al Ansari Lighting Group. The centre embraces Janabiya’s identity. INSET: Finishing materials were carefully chosen. Other contractors and suppliers include the Horti Group which is undertaking the landscaping works, Abdul-Aziz Aluminium for aluminium works, Kazerooni Building Products for roof tiles, and Marmara Trading for ceramic tiles and sanitary ware. First Bahrain Real Estate Development Company is an innovative regional real estate developer established in Kuwait in October 2004. It has a paid-up capital of KD23.3 million ($76.57 million) and owns or holds rights to more than 1 million sq ft of strategically located sites in Bahrain. Dedicated to achieving sustainable returns through collaborative relationships, the company creates enduring value for all stakeholders with a demand-driven investment approach. Operating out of Bahrain and Kuwait, First Bahrain is strategically positioned to execute projects across the GCC, in accordance with the principles of Sharia. First Bahrain is well known for Majaal, an SME (small and medium enterprises)-focused industrial facilities development at the Bahrain Investment Wharf in Hidd. The $40-million complex includes seven buildings which are fully leased to a diverse portfolio of tenants, generating a stable cash flow for the company. 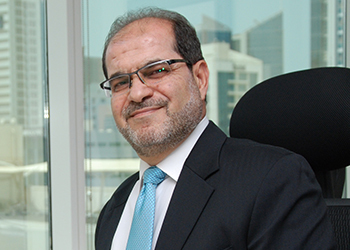 Building on its success in industrial property, First Bahrain has now expanded into commercial development with El Mercado Janabiya, a neighbourhood market due to open to the public in spring 2016.